"This is progress for you, social-networking that does not involve lamp-posts." 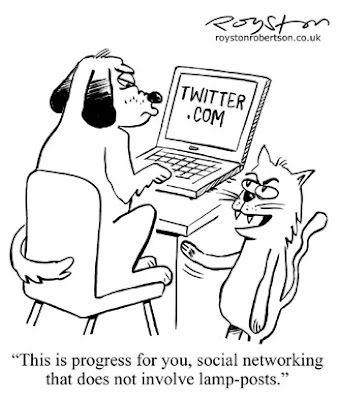 Here's a cartoon about Twitter, which was drawn to accompany an article about a dog that has its own Twitter feed. No, really! OK, maybe the owner had something to do with it. I set up a Twitter account recently. I was very sceptical about it at first, as I couldn't see the point of it. But as with all these sites, you really have to try them out to see what it's all about. I can use it in a social-networking way or to point people in the direction of this blog and my portfolio site. I find that it's a lot more instant than Facebook and it's also good fun. There are a lot of very funny people on there, such as ace comedian Peter Serafinowicz and the comedy writer Graham Linehan, sharing thoughts and links. My Twitter updates now appear on the right of this blog (though obviously some of the links would just send you back here!) 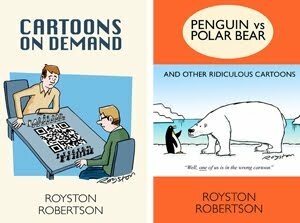 or you can follow me at twitter.com/roystoncartoons. that's a very good gag! yes i saw you'd got into twitter -- quite fun looking at your twitter posts on here, but i don't think i could get into that -- i waste quite enough time messing about online as it is! Yeah, Twitter is a bit of a time-waster! But for some reason it seems to have a higher proportion of genuinely funny people than most social networking sites, so you do get quite a few laughs out of it. I'm sure the novelty will wear off though. Good one Royston! This one should sell, no problemo! Thanks Dan, it already has sold, as it was a commissioned cartoon. The "social networking" line was lifted from a gag that was doing the rounds of the general gags market but did not sell. It didn't mention Twitter, though. Maybe that was the clincher, adding extra topicality. Maybe I should send it to the mags again!